Lori Park's studio is in Marrakech, Morocco, the source of much of her inspiration. In 2016 Lori Park was awarded “Trophee: Femme, Art Et Climate” by the Kingdom of Morocco and the United Nations Development Program, for her artwork exploring the subject of climate change and women, a body of work she had been developing for a number of years. During COP22, Lori had both solo and group exhibitions inside the Green Zone of COP22 Marrakech (Conference Of the Parties to the United Nations Framework Convention on Climate Change), an international conference that drew thousands. Simultaneously to these two shows inside COP22, she had a third exhibition - a larger solo show - in a private palace in Marrakech. All three shows included her work on these subjects. Lori studied botany, zoology, economics, and policy analysis, with a graduate degree from Harvard University. She worked on salmon fishing boats in Alaska and as a wilderness/dogsledding guide and marine biologist before working for the US Environmental Protection Agency in Washington D.C. She left the EPA to pursue her art full-time. Lori Park's large-scale bronze work has been shown at Sotheby's "Beyond Limits" the world-renowned exhibition of monumental sculpture held at Chatsworth House, the Duke of Devonshire's estate in England. Her sculpture at “Beyond Limits” was exhibited alongside the work of other artists including Aristide Maillol, Germaine Richier, Xu Bing, Alice Aycock, Beverly Pepper, Marc Quinn, Bill Woodrow, Antony Gormley and Eduardo Chillida. In 2018 her solo exhibition "Lori Park: 10 Years Past to Present” was a featured VIP event of the 1-54 Contemporary African Art Fair, held in Marrakech February 24-25 - it was the inaugural launch of the 1-54 Fair on the African continent (editions held yearly in London and New York City). This survey of her work "Lori Park: Africa 10 Years Past To Present" included over 100 of her works reflecting the influence of North Africa on her art since her arrival to Marrakech in 2005. Her solo exhibition filled the interior spaces, domes, and grounds of the Palais Aiziza and Spa, in the Marrakech Palmeraie - with her large-scale installations, textural panels, wire suspensions, multi-media, bronze and concrete sculptures, assemblages, and cyanotypes. The exhibition ran through October 2018. Lori's art work is in the UK National Collection. She exhibited with the Marrakech Biennale in 2014 and 2016, and at the Museum of Marrakech in 2007. 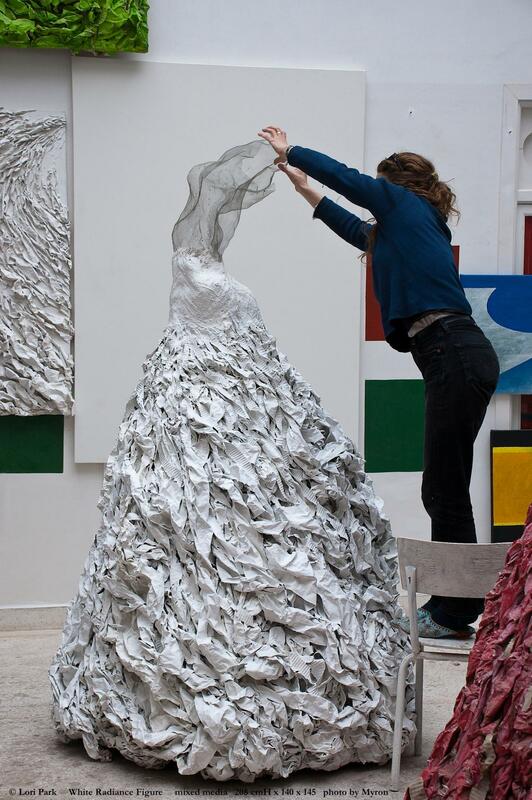 She has also had recent solo exhibitions in Bath, England, and in Saint-Rémy-de-Provence, France. Lori Park’s work “The Dogs of Longleat House” -a historical depiction of the Thynn family dogs as larger-than-life-size wire sculptures - is on permanent display at Longleat House, Lord Bath’s estate in England. Marrakech-based artist Lori Park works in many materials, from large-scale bronze to multi-story wire suspensions, large textural panels and collage, floating spirals, found-object assemblages, printmaking, photography, assemblages, and installations in landscape.